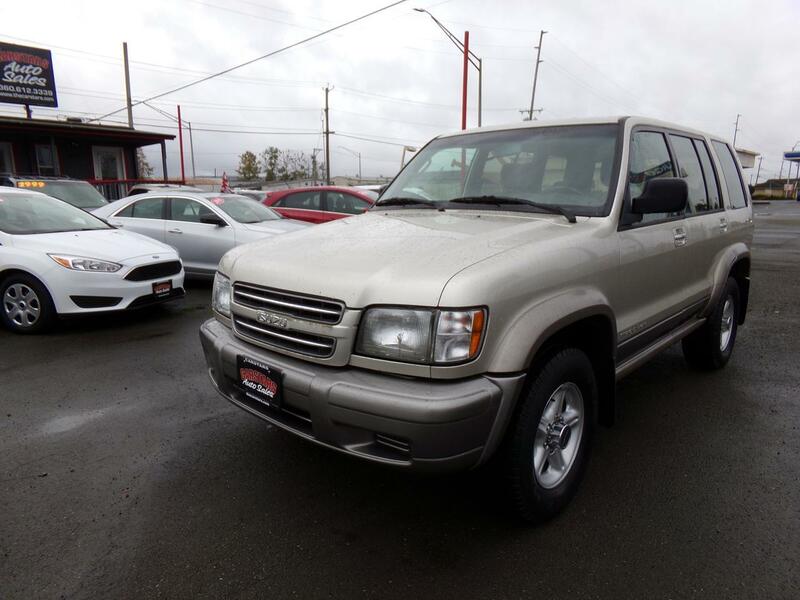 This outstanding example of a 2002 Isuzu Trooper S is offered by Carstars Auto Sales. This Isuzu Trooper S is an incredibly versatile vehicle that is a "must have" for any family. You'll instantly stand out with this hard-to-find 2002 Isuzu Trooper S. Be sure to prepare yourself to get noticed in this ultra rare Isuzu Trooper. The Isuzu Trooper S will provide you with everything you have always wanted in a car -- Quality, Reliability, and Character. You can finally stop searching... You've found the one you've been looking for. Check out this gently-used 2002 Isuzu Trooper we recently got in. This Isuzu Trooper offers all the comforts of a well-optioned sedan with the utility you demand from an SUV. A truly breathtaking example of pure vehicle design achievement...this is the vehicle of your dreams! Just what you've been looking for. With quality in mind, this vehicle is the perfect addition to take home. The look is unmistakably Isuzu, the smooth contours and cutting-edge technology of this Isuzu Trooper S will definitely turn heads. Contact Carstars Auto Sales today for information on dozens of vehicles like this 2006 Jeep Commander Limited. As a compact SUV, this vehicle packs all the performance of a full-size into a package that easily navigates the urban terrain. Exceptional in every sense of the word, this incredibly low mileage vehicle is one of a kind. You can finally stop searching... You've found the one you've been looking for. This is the one. Just what you've been looking for. This 2006 Jeep Commander Limited is proudly offered by Carstars Auto Sales Do so much more with one vehicle. This Jeep Commander gives you everything you need an automobile to be. This vehicle has extremely low mileage on the odometer, so while it's pre-owned, it's practically new. The quintessential Jeep -- This Jeep Commander Limited speaks volumes about its owner, about uncompromising individuality, a passion for driving and standards far above the ordinary. There is no reason why you shouldn't buy this Jeep Commander Limited. It is incomparable for the price and quality. Carstars Auto Sales is honored to present a wonderful example of pure vehicle design... this 2005 Honda Pilot EX-L with RES only has 122,695mi on it and could potentially be the vehicle of your dreams! This Honda Pilot offers all the comforts of a well-optioned sedan with the utility you demand from an SUV. This vehicle has an added performance bonus: AWD. It improves handling on those winding back roads, and gives you added safety and control when driving through wet and snow weather conditions. The Pilot EX-L with RES has been lightly driven and there is little to no wear and tear on this vehicle. The care taken on this gently used vehicle is reflective of the 122,695mi put on this Honda. The Honda Pilot EX-L with RES does not disappoint, and even comes with an Entertainment Package that will impress even the most apprehensive buyer. You'll definitely want to check out this Honda. Added comfort with contemporary style is the leather interior to heighten the quality and craftsmanship for the Honda Pilot Clean interior? How about flawless. This Honda Pilot looks like has never been used. You demand the best in everything, so why would your automobile be any different? Enjoy the best features available in this stunning Honda Pilot. Carstars Auto Sales is excited to offer this 2005 Honda Pilot. Do so much more with one vehicle. This Honda Pilot gives you everything you need an automobile to be. This Honda Pilot is equipped with AWD for improved handling. Whether you're faced with inclement weather or just out enjoying the twisting back road, you'll have the grip of AWD on your side. Exceptional in every sense of the word, this incredibly low mileage vehicle is one of a kind. This 2005 Honda is a unique find -- pair it with a Rear Entertainment Package and you have hit the jackpot. Marked by excellent quality and features with unmistakable refined leather interior that added value and class to the Honda Pilot They say beauty is on the inside and once you experience the unbelievable options in this Honda Pilot, you'll agree that this is one beautiful vehicle. Carstars Auto Sales is honored to present a wonderful example of pure vehicle design... this 2005 Honda Pilot EX-L with RES only has 122,619mi on it and could potentially be the vehicle of your dreams! This SUV is a superb example of what a tough, work focused vehicle should be. Exceptional towing, acceleration and torque will help you get the job done. Enhanced performance, a refined interior and exceptional fuel economy are just a few of the things you'll enjoy about this all-wheel drive vehicle. This 2005 Honda Pilot has such low mileage it has been parked more than driven. Driven by many, but adored by more, the Honda Pilot EX-L with RES is a perfect addition to any home. Check out this gently-used 2000 Chevrolet Suburban we recently got in. In their original incarnation, SUVs were chiefly owned by folks who valued "utility" above "sport." Not anymore! The Chevrolet Suburban LT redefines the SUV and makes the perfect "all around" family companion. When Chevrolet created this vehicle with 4 wheel drive, they immediately enhanced the performance ability. Easily switch between two and four wheel drive to take advantage of the improved steering and superior acceleration. This 2000 Chevrolet Suburban has such low mileage it has been parked more than driven. Marked by excellent quality and features with unmistakable refined leather interior that added value and class to the Chevrolet Suburban This rare vehicle is a prime example of automotive engineering ? perfected. Contact Carstars Auto Sales today for information on dozens of vehicles like this 2000 Chevrolet Suburban LT. Treat yourself to an SUV that surrounds you with all the comfort and conveniences of a luxury sedan. When Chevrolet created this vehicle with 4 wheel drive, they immediately enhanced the performance ability. Easily switch between two and four wheel drive to take advantage of the improved steering and superior acceleration. The Suburban LT has been lightly driven and there is little to no wear and tear on this vehicle. The care taken on this gently used vehicle is reflective of the 154,041mi put on this Chevrolet. The look is unmistakably Chevrolet, the smooth contours and cutting-edge technology of this Chevrolet Suburban LT will definitely turn heads.